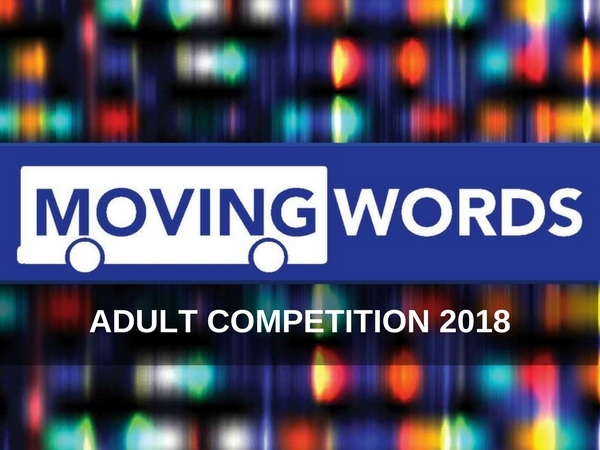 This year's Moving Words Adult Competition 2018 theme "Ripped from the Headlines" asked poets to respond to what they see, or don't see, in today's headlines. Six winning poems and four honorable mentions were selected from more than 230 poems by this year's judge Teri Cross Davis. View the six winning poems below and on Arlington’s ART buses from April through September 2018. Also join us for the Winner's Reading at New District Brewing on April 8, 2018.
who needs to be fed and how. the shopping, the planning, the preparing. warm breeze, as summer ripens. Measurements persisted, not unlike scrutiny. from 29 inches to 23.5 by wedding day. our bravado grew as hers receded. our train ran like a river out of a compressed spring. We knew time and measuring tape limit all. lace as a chain, veil as iron bars. Some hands grab for dirty work, up close. So my daughter’s pit bull runs with her at dawn. My wind-worn wings can’t span the sky. For her sake, I want to be what’s strange and terrible. Osiris’ black jackal would intercede. His job? To drag the corpse of lust’s assumptions underground. To weigh its shriveled heart. But could I recognize deceit seeping from the pores? Maybe not. Pit bulls possess a better sense of smell. make this again a place of safe harbor. with eight planets just like ours. do they have mountains? Do they have courage? Do they have honey bees? Do they have words? as he’s tickling her thigh. while here night closes her fist. a star’s kiss won’t pierce it. so on a plain gray desk, a blunt red pen crossed out[transgender] and they were gone. Praise the tiny black ants. and then to bloom again. their ant mounds, their single-mindedness. of this world belongs to me.